Keen to put your fitness levels to the test while supporting a great cause? 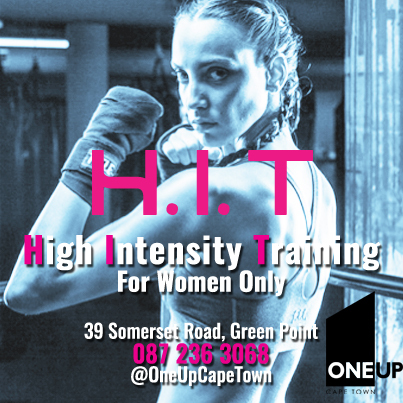 Then do check out OneUp Cape Town‘s new High Intensity Training (H.I.T) class on the 23rd of April. As this is #SexualAbuseAwarenessMonth, the team at OneUp are trying to rally people together in an effort to raise money for Blow The Whistle – an anti-crime initiative aimed at protecting and empowering the women & children of South Africa. But what is H.I.T all about? In their words it’s a “45min cardio blast guaranteed to have you sweating like a pig and looking like a fox!” The class is open to women only, but both OneUp members & non-members are welcome, and the class is also open to all fitness levels. A portion of the class cost will be donated to Blow The Whistle by OneUp Cape Town along with all funds collected in the donation jar on the night. By donating you’ll also put yourself in the running for some great prizes, like: Candy Nails treatments, makeup from Alila, and Fake Bake products. Spots are limited though: Only 50 spots are available and therefore booking is essential – give them a call on 087 236 3068 to secure your spot. As an added bonus – Each lady will also receive pink whistle pendant from Blow The Whistle, a complimentary water bottle from GNC, and a ‘frotein’ after the class. Also, if you happen to love the H.I.T class, you’ll be happy to know that they’ll be offering it on a monthly basis moving forward AND that they plan on supporting Blow The Whistle on a regular basis. I’m gonna be there… And I’m ready to roll people… Hopefully I’ll see some of my Cape Town My love ladies there too.